CarlSpackler.com - The best Caddyshack site on the web, hands down. 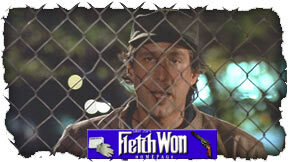 The (Un)Offical Fletch Homepage - Cool site...what makes this one good are the lyrics to the soundtrack. Chevy Chase Central - A great site dedicated to Chevy, the man who you're not! Tom's Fletch Photos - A bunch of cool pictures not seen anywhere else. Nice enough to let us use them. News Askew - The best spot on the web for all your Kevin Smith needs. Updated News and more. The Movie Portal - A Great site for movie scripts, quotes, wallpapers, news and more! Celeb Fan Page in Honor of Chevy Chase - Page with a short bio, movie ratings, and other stuff. The Offical William Sanderson Homepage - Jim Swarthout himself...Check out his great site! Laker Jim's Kurt Rambis Homepage - The Ultimate website for the man who slapped black rims on the NBA. The Laker Ground - The Most Complete Updated Lakers site out there.